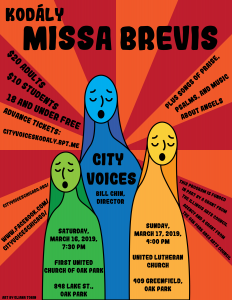 Join us Saturday, March 16, 7:30pm, at First United Church, 848 Lake St, Oak Park, or on Sunday, March 17, 4:00pm, at United Lutheran Church, 409 Greenfield St, Oak Park. You may purchase tickets in advance. JOIN US FOR OAK PARKS BIG-HEARTED, JOYOUS CHRISTMAS GIFT …from our community to our community. This year we celebrate our twelfth anniversary, with three choirs, special guests, and the Sing We Joyous Orchestra creating the beautiful music and ridiculous hijinks youve come to expect from this beloved holiday concert for the whole family. We’ll bring you the annual epic adaptation of the Twelve Days of Christmas, audience carol sing-alongs and special effects that make this the best Christmas show ever! From the sublime to the wacky, this lovely show has something for everyone. 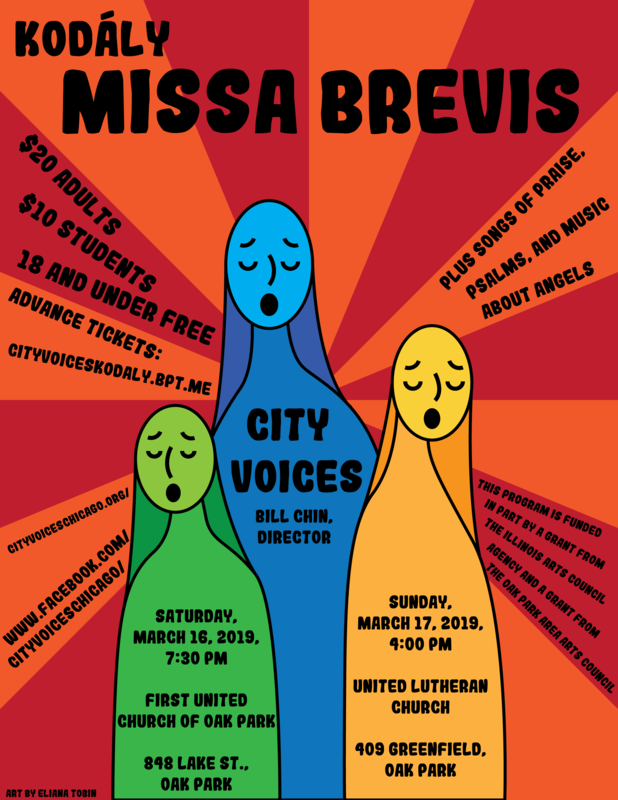 Artists: The Oriana Singers, Pro Musica Youth Chorus, and City Voices, with the Sing We Joyous Orchestra. Bill Chin, Director. Join us at 6:30pm, Saturday, Dec. 8, for a silent auction and pre-show party. Concert begins at 7:30pm. Sunday, Dec. 9 concert only, beginning at 4pm. Free childcare available at both performances. You may purchase tickets at https://singwejoyous.brownpapertickets.com or purchase tickets at the door. 18 and under free. Collaboration with Symphony of Oak Park and River Forest. Sunday, October 7, 2018, 4pm, preconcert conversation 3pm. We are auditioning for all voice parts. See the Sing With Us! page or contact auditions@cityvoiceschicago.org for more information.